Especially since it is not in France? Step back, look at the overall design. The hip roofline is the strongest French design element. are classical elements in a French roof. is the symmetry in the building, not just the roof. The building is a square. The deck step is centered. French design in the garden shed. create even more French flair. add an authentic French touch. which adds to the French look. is closer to red than to green on the color wheel. French gardens are much more structured and symmetrical than English gardens. both in shape and symmetrical position. see French Country Style Deck. truly reminiscent of Parisian parks. the shade of a pear tree in the back yard. growing in a pot on the house deck. 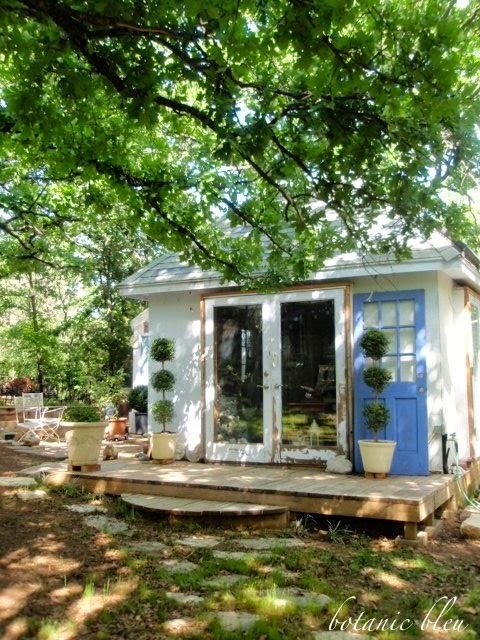 how the French garden shed began. It's gorgeous, Judith! I'm ooooing and ahhhhing over every image. Slowly, I hope to have our cottage take on more French details like yours. So glad we found one another in blogland! Just gorgeous shed! 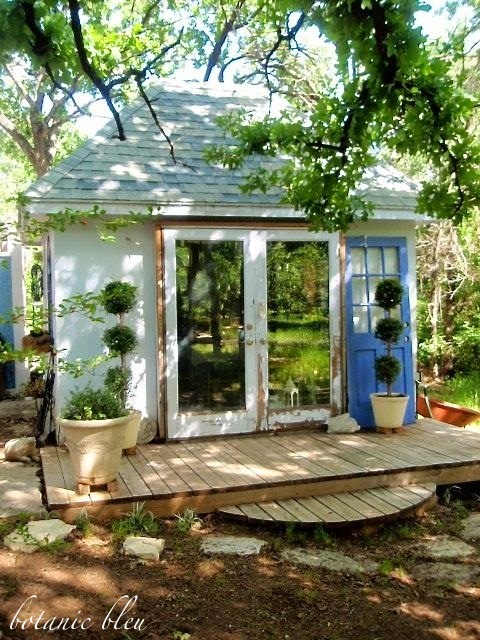 I would love a space like that in my back yard. Beautiful! Sigh..............that's all - just me sighing from across the miles. Dear Judith, Thank you so much for coming by! 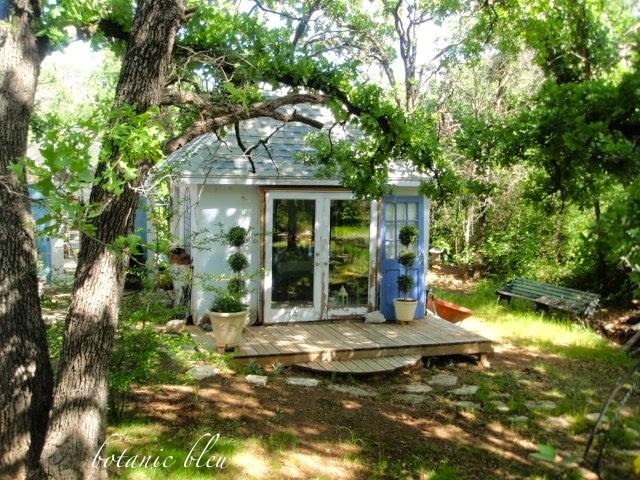 I'm so in love with your French garden shed. It looks more like a French cottage! It's beautiful! LOVE the topiaries, blue paint, roof line . . . all of it! Looking forward to seeing more of your transformations. Wow Judith, your garden shed is stunning - I love everything about it. 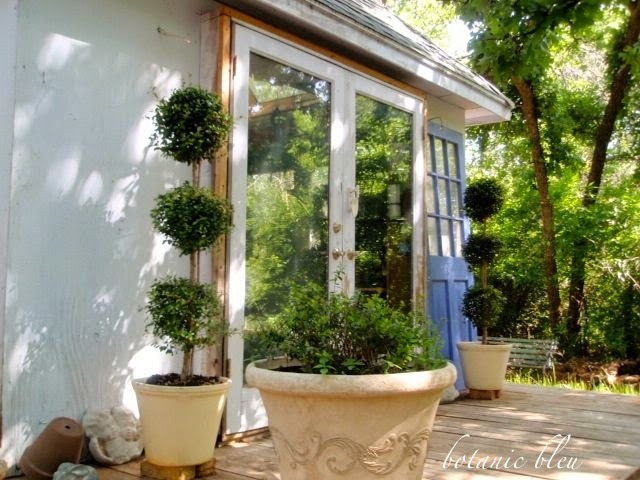 The roof line, the French doors, the pretty blue door leaning against it, the topiaries. So glad I saw your link at the Fabulously Creative Friday party and now I'm a new follower! 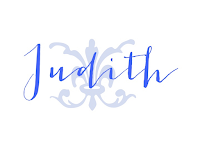 Love it, Judith! We haven't had a garden shed since we left Iowa. That one probably shouted more 70's than any other design. LOL I did use it as a back drop for quilt photos though as it was dark brown cedar siding matching the house. Other than that, it was pretty utilitarian rather than beautiful as yours is! Elegant, but not intimidating - you've created something quite lovely. 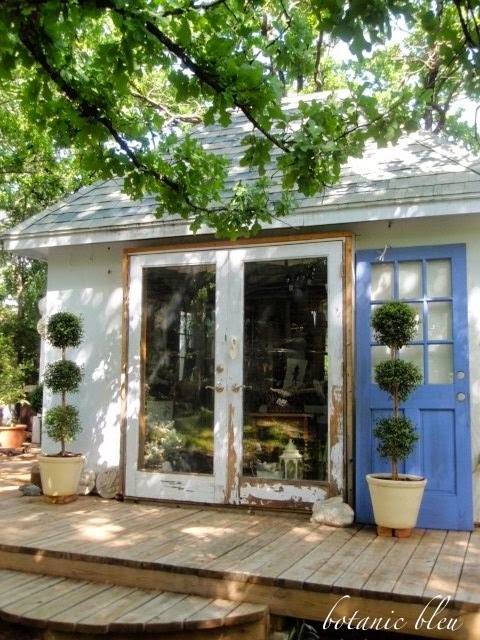 Love your shed and the topiaries are amazing. Thanks tons for linking to Inspire Me. 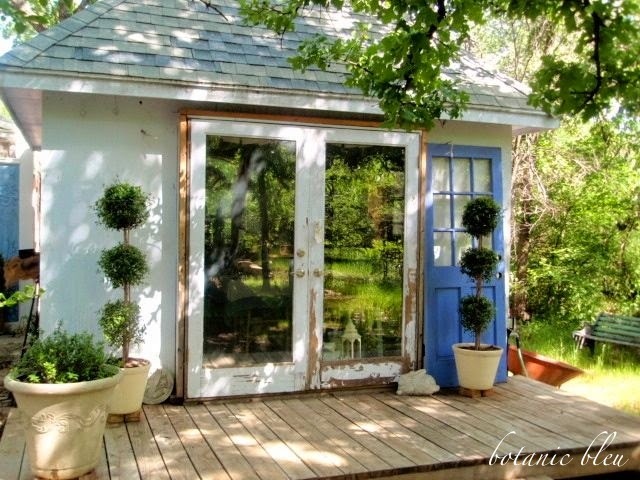 I love your shed and all the French details! I want to see inside too! 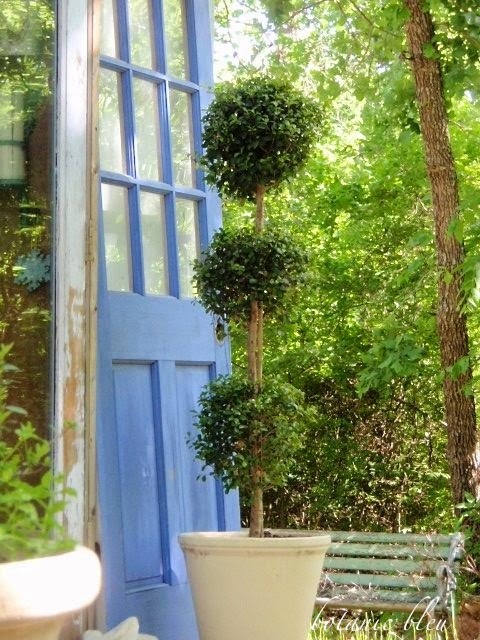 The blue door and topiaries just make it. Thanks for linking up to Centerpiece Wednesday and sharing with us. It is so pretty! 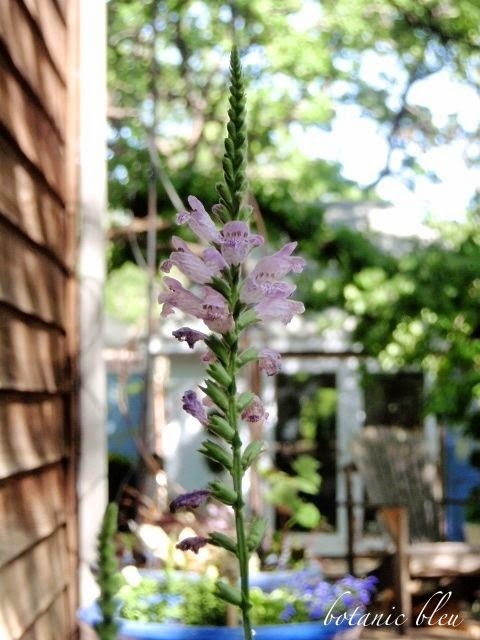 More to enjoy in the back yard!